This year, KraussMaffei’s Reaction Process Machinery (RPM) celebrates not only the 180th anniversary of KraussMaffei as a whole but also its own jubilee. In 1968—exactly 50 years ago—its first specialised clamping unit with two rotation axis for processing polyurethane was introduced to the market. This launch triggered a development resulting in a wide variety of products and processes thanks to which it has been possible to further improve the performance capacity of PUR components and other matrix systems. “We look back with pride on 50 years of reaction process machinery. During this period, with its numerous new technologies and processes KraussMaffei made a decisive impact and promoted the development of reaction process machinery all over the world”, explains Nicolas Beyl, President of the segment Reaction Process Machinery and Managing Director of KraussMaffei Technologies GmbH. 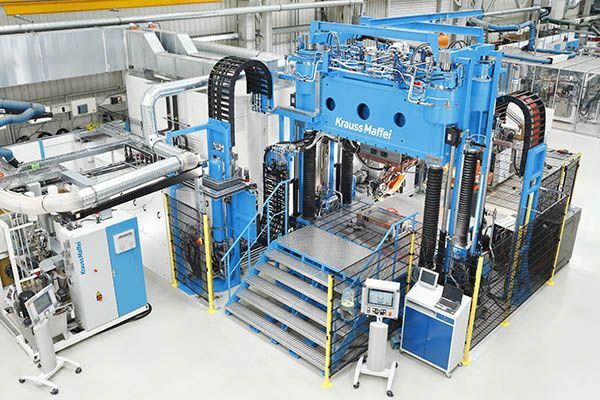 At the beginning of the 1960s KraussMaffei had already been a supplier of injection moulding machines for several years; in 1967 an idea emerged to not only process thermoplastics but also to include the processing of duroplastic systems such as polyurethane in the portfolio. The first mould carriers (“Moon-Swing”) were introduced to the market in 1968 together with PUR systems from Bayer. With the development of the first self-cleaning mixing head in 1970, which operated on the high-pressure counterflow injection principle, KraussMaffei set the first milestone. The low-pressure technology that had established itself on the market up to that point was extended by a process that also made the discontinuous production of parts in shot operation possible. In the late 1970s, the first car seats made of moulded foam were produced in series using this process. Nor did the development come to halt in following years. New technologies for new applications were added continuously. The subject of R-RIM (Reinforced Reaction Injection Moulding) for the furniture industry, for example, was a focal point in the 1970s. By the 1980s, the new subject was Ny-RIM, the processing of caprolactam. KraussMaffei also put this experience to use in the 2010s when developing the T-RTM (Thermoplastic Resin Transfer Moulding) process. The 1990s and the following years were characterised by new technologies for fiber-reinforced lightweight construction. KraussMaffei set a highlight here, for example, with LFI technology (Long Fiber Injection), which permits the production of particularly large components such as engine hoods for harvesters and other agricultural machines. A further important trend in this period was the development of innovative surface processes. Milestones at this time included, for example, Clear Coat Moulding (CCM) developed by KraussMaffei – a process for flow-coating of wooden surfaces in automobile construction – or the ColorForm process in which a thermoplastic basic body is flow-coated with polyurethane to achieve haptic effects or a particularly high-gloss surface finish. “The development of the ColorForm process is an excellent testimony to the unique system competence of KraussMaffei. As one of the few suppliers on the market, we offer all three technologies that are decisive for this process: Injection moulding machinery, reaction process machinery and automation from a single source. These synergies combined with good cooperation of the teams are important elements of the sustained success of KraussMaffei”, explains Nicolas Beyl. We also expect development at KraussMaffei Reaction Process Machinery to continue in the coming years. Two of the latest milestones in the area of composites, for example, are wetmoulding, a particularly cost-efficient alternative in comparison to the classic RTM process in which the complete preforming process is omitted, or the iPul pultrusion systems. An important step in the expansion of system expertise at KraussMaffei Reaktionstechnik was taken in 2005. The two new locations in Viersen and Georgsmarienhütte supplement the portfolio with the areas moulding tool construction and trimming technology. Since then, KraussMaffei has been providing its customers with turnkey solutions for automotive interiors and can actively participate in the project management during the vehicle development at a significantly earlier stage. The moulds made at the Georgsmarienhütte location are suited to manufacturing flexible foam, solid foam, semi-solid foam or soft integral foam. Viersen, the location in charge of trimming technology, supplies conventional punch presses as well as the flexible processes configured as robot-guided milling and cold knife solutions. From humble beginnings 50 years ago, KraussMaffei Reaction Process Machinery nowadays is one of the three main pillars of KraussMaffei Group. KraussMaffei Reaction Process Machinery currently produces around 300 plants per year. This should be expanded in the future. “We regard the continuously changing requirements as a stimulus for the development of new technologies and innovations and intend to use this to strengthen and build on our market position – entirely in line with the motto Technology Pioneers”, adds Nicolas Beyl.